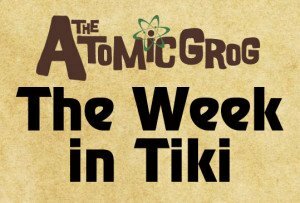 This week’s top story is the sellout of two upcoming events: the Chicago Area Tiki Tour, and the Vintage Tiki Weekend in Wildwood, N.J. Also, tickets for Tiki Kon in the Pacific Northwest are selling fast. We have news on award-winning Tiki barman Brian Miller’s decision to remain in New York City. Plus, get updates on Aloha Isle and Sunshine Tree Terrace swapping locations in the Magic Kingdom’s Adventureland, and a Tiki disappointment in the National Trust for Historic Preservation’s historic bars contest. Our weekly features spotlight artist Eric October, Marina the Fire Eating Mermaid’s new website, the music of Gold Dust Lounge, and the Tambu Lounge at Disney’s Polynesian Village Resort. The rum of the week, Mount Gay Eclipse, is featured in the The Monaco cocktail. New York City’s Tiki scene is breathing a collective sigh of relief this week after award-winning bartender Brian Miller had a change of heart and decided to not make a move to the West Coast. 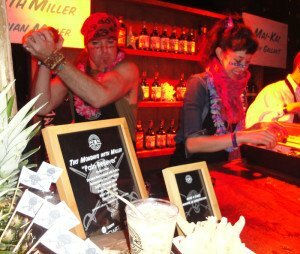 After winning “The Art of Tiki: A Cocktail Showdown” on Feb. 20 at the South Beach Wine & Food Festival, the host of the popular Tiki Mondays With Miller events said he planned to migrate from the Big Apple to Los Angeles. However, in an e-mail received Sunday, the Tiki pirate said he said he now realizes that “New York City is where I want to be right now.” Miller’s next Tiki Monday shindig is set for April 20 at Pouring Ribbons. You can also catch Miller pouring cocktails and presenting a symposium June 10-14 at The Hukilau in Fort Lauderdale. The Vintage Tiki Weekend at the Caribbean Motel – scheduled for May 15-17 in historic Wildwood, N.J. – sold out just 10 days after it was announced on March 2. Organizer Mod Betty of Retro Roadmap posted the news on Facebook on Thursday. Those lucky enough to snag one of the 30 rooms at the 58-year-old classic motel will be treated to a Wildwood bus tour, Tiki fashion show, music and cocktails, happy hours, a pig roast, Polynesian appetizers, and more. Another event also announced a sellout: the Chicago Area Tiki Tour. 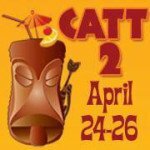 If you don’t have tickets, your only chance to join the festivities April 24-26 for a bus tour of the Windy City’s best Tiki bars and restaurants is to get on a waiting list and hope somebody cancels. 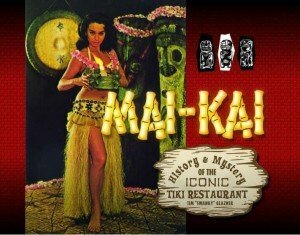 Organized by the Red Palms Chapter of the Fraternal Order of Moai, the tour will visit Chef Shangri-la, Hala Kahiki, Lost Lake, Three Dots and a Dash, and The Tiki Terrace. There will also be an exclusive kick-off party at the host hotel featuring surf band the Cocktail Preachers. Meanwhile, tickets for Tiki Kon Air Flight #13 – scheduled for July 10-12 in Vancouver, Wash., and Portland, Ore. – are selling briskly after going online Saturday. It was announced on Facebook that all of the “first class” and full weekend passes were sold, meaning that the event’s famous Sunday brunch and home bar tour were full. There’s a waiting list in the works, plus plenty of “standard/economy” passes, which include all the Friday/Saturday/Sunday shows and many of the Saturday activities. Tiki Kon is also looking for bartenders to complete in the next Iron Tikitender contest. Three finalists from around the country will face off for the title and cash prize on Saturday, July 11. As expected, two of the Magic Kingdom’s most popular exotic treat locations have traded places in Adventureland. The Disney Food Blog posted photos and full coverage of Thursday’s moves by Aloha Isle (home of the Dole Whip) and Sunshine Tree Terrace (home of the Citrus Swirl). The moves are reportedly related to the possible opening of a new restaurant in the Adventureland Veranda. Nearly everything available at the old Aloha Isle is available at the new location, including the souvenir Tiki mug. Unfortunately, all four Tiki landmarks were eliminated in the first round of The Big Tap: 2015 Historic Bars Tournament, presented by the National Trust for Historic Preservation. The Mai-Kai (Fort Lauderdale), Bali Hai (San Diego), La Mariana (Honolulu), and the Tonga Room (San Francisco) did not make it out of the initial round of 32 competitors in the online popularity contest, which continues through April 3. Eric October (left) made his first visit to The Hukilau in Fort Lauderdale with partner Manuel (right) in June 2014. Hurricane Hayward welcomes them to The Mai-Kai. 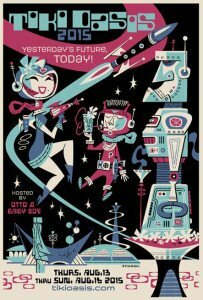 To say Southern California artist Eric October is plugged in to the Tiki scene would be an understatement. He creates artwork in a dizzying array of media (mugs and ceramics, paintings, graphic design, animation, fabrics and objects, et al.) and makes the rounds of nearly every major California event. 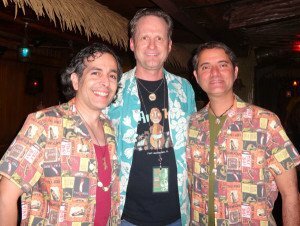 He helped organize last week’s 10th anniversary of the rebirth of the Tonga Hut in Hollywood and has contributed his talents to a wide assortment of projects and events, such as Mai Tai glasses for The Quiet Village podcast and the cover artwork for the Meet The Tiki Delights album. Eric also contributes to Tiki Magazine & More as a staff writer. Aquatic performer and entertainer MeduSirena, aka Marina the Fire Eating Mermaid, is a truly unique presence in today’s Tiki and retro scenes. Check out her redesigned website to get an idea of the scope of her talents, from her signature underwater performances at The Wreck Bar in Fort Lauderdale Beach’s at B Ocean Resort, to fire and stunt dancing, to vaudeville/burlesque. Marina’s Fire Eating Mermaid persona has become a Polynesian Pop culture figure, appearing in comics and at events across the country. But Marina Duran-Anderson is also an accomplished performer of Taiko, a traditional Japanese drum. Be sure to also like Marina’s recently re-launched Facebook page and follow The Wreck Bar page. In addition to her regular happy hour swimshows with her pod of “Aquaticats” on Fridays and Saturdays at the Wreck Bar, you can catch her in June at The Hukilau in Fort Lauderdale. 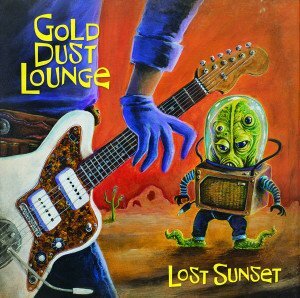 ‘Lost Sunset,’ featuring cover artwork by Robert Jimenez. This Miami instrumental surf-spy-jazz ensemble led by guitarist Russell Mofsky is riding a wave of success since the release of the band’s first proper album, Lost Sunset, in June. Partially funded by fans via Kickstarter, the 10-song release captures Mofsky’s ambitious mash-up of sounds and styles that range from mid-century exotica to 1960s garage rock. Favorite tracks include Bunny Yeager, Humble Hill, Riff Raff, and Sidewinder. Catch the band on a rare tour of New York and New England this month with dates beginning Saturday at the 2300 Degrees Festival in Corning, N.Y. [Tour preview | Facebook event] Gold Dust Lounge will also be performing for a fourth straight year at The Hukilau in Fort Lauderdale in June. Soon to be overshadowed by Trader Sam’s Grog Grotto, the much-ballyhooed Tiki bar opening in just a few weeks in the venerable Disney World resort, Tambu Lounge needs to be given proper credit and due respect for its 43-year tenure as the only true bastion of Tiki and rum cocktails in Disney World’s many bars and restaurants. 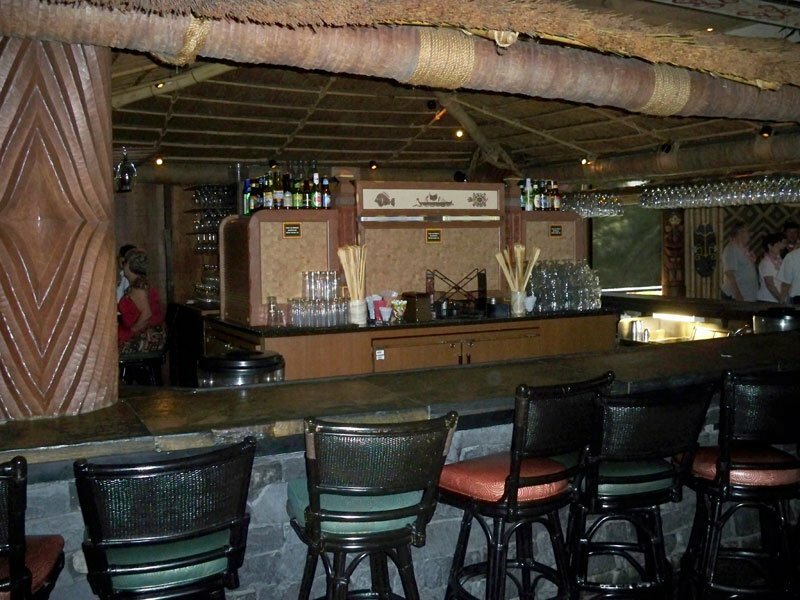 It will continue to be a busy bar, servicing both of the Polynesian’s table-service restaurants in the Great Ceremonial House – ‘Ohana and Kona Cafe. But it’s long been known for its two signature topical drinks: the Lapu Lapu (a concoction featuring 151 rum and served in a hollowed-out pineapple) and the Backscratcher (a version of the classic Tropical Itch that includes rum and whiskey plus a wooden backscratcher). Granted, Disney World’s bar menus have become homogenized in recent years. 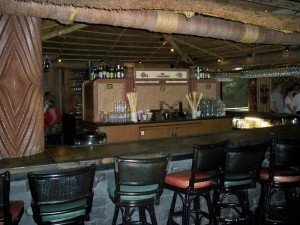 But if you find a veteran bartender, it’s still possible to order classics from past Tambu Lounge menus such as the Scorpion, Navy Grog and Zombie. And the bar, which is open from roughly 1 p.m. to midnight, has a great food menu featuring signature items from the restaurants, such as pork sliders and bread pudding. Just a short walk from the Polynesian’s monorail stop, this Tiki comfort zone will always be worth a visit during any Disney World adventure. Don’t miss: Disney artists Kevin Kidney and Jody Daily will be appearing at The Hukilau in Fort Lauderdale in June, presenting a symposium titled “Prefeb Paradise” on the origins and design of Disney Polynesian Village Resort. Tickets are on sale now. 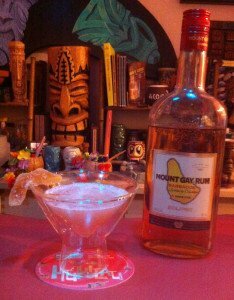 One of the most versatile of the many excellent gold rums from Barbados, Mount Gay Eclipse can be sipped neat, but it’s best used as a mixer. Rich, harmonious flavors including vanilla and orange mingle in this sharp, young rum. Eclipse is the flagship rum of Mount Gay Distilleries, which dates back to 1703 and is considered to be the oldest rum brand in the world. If you ever visit Barbados, be sure to take one of the distillery’s tours and experience the rich history of this respected rum. Shake with ice cubes and strain to a chilled cocktail glass or champagne coupe. Garnish with candied ginger. Simple and elegant yet very much a Tiki drink with the classic trio of gold rum, lime and bitters forming a solid backbone. The agave and chocolate blend perfectly, giving the drink a rich yet subtle sweetness that makes it dangerously drinkable. Don’t skip the candied ginger. It’s a great final touch. 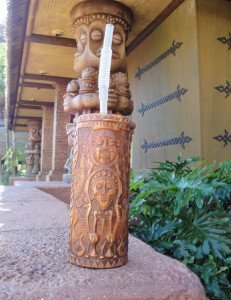 This entry was posted in 2015, Art, Cocktails, Culture, Disney World, Events, History, Hukilau, Music, Other Florida, Recipes, Resorts, Reviews, Rum, South Florida, The Week in Tiki and tagged Adventureland, Brian Miller, Caribbean Motel, Chicago Area Tiki Tour, Disney World, Dole Whip, Eric October, Gold Dust Lounge, Hukilau, Iron Tikitender, Magic Kingdom, Marina the Fire Eating Mermaid, Mount Gay rum, Polynesian Resort, recipe, rum, Tambu Lounge, The Monaco, Tiki Kon, Walt Disney World, Wildwood, Wreck Bar. Bookmark the permalink.